If Hollywood has taught us anything, it’s that just because a film franchise has been rebooted, there’s no law expressly stating that one can’t return to its original timeline. Halloween has already done so with great success, and I’m sure more than a few people are wishing that Hellboy can do the same. Another fine example of this is that of Ghostbusters. After another cast and crew gave it a go a few years back, their effort ultimately failed to resonate with the majority of moviegoers. Understandably, the studio has opted to return to the original vision, but it remains to be seen if lightning can be captured in a bottle for a third time. 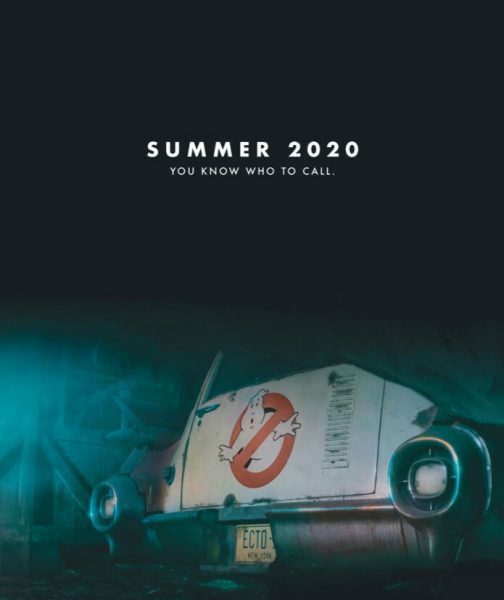 In an attempt to whet our appetites well in advance of summer 2020, Sony Pictures have released two new posters pertaining to the series. Though both can be viewed in the gallery below, I’m sure the first will excite fans most, as it teases the highly anticipated Ghostbusters 3 by displaying the iconic Ecto-1 vehicle. The second exhibit, meanwhile, has to do with the original flick. Celebrating its 35th anniversary, this advertisement should get you hyped for any limited engagement screenings to be held this year. Plus, it also aims to get audiences geeked for other big 2019 releases such as MIB International, Zombieland: Double Tap, Bloodshot, Jumanji: The Next Chapter, Peter Rabbit 2 and several others. Ghostbusters 3 is set to arrive in theaters on July 10th, 2020. And even though there seems to be some back and forth regarding Ernie Hudson’s return, my gut says he’ll be part of the threequel, most likely with Dan Aykroyd and Bill Murray also in tow.